Giveaway Alert!There will be 2 winners for this giveaway! One winner will receive a Reminder Set by Bagnesia – ECO-ngratulations Cinella! ; the second winner will receive a set (4) of produce bags – ECO-ngratulations Lauren! by Bagnesia. Bagnesia: a person’s forgetfulness to grab their reusable bags. Like most people these days I have about 20 reusable bags from various stores around the area. I’m pretty good about remembering them when we go to the grocery store but I often forget when we go shopping anywhere else. And there are always those days you just plain forget…even at the grocery store. 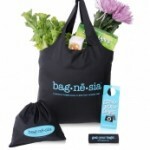 Bagnesia has created a product to help you remember your bags! The Bagnesia Reminder Kit includes one compact reusable bag, one door hanger, one steering wheel wrap, a clip, and a carrying pouch. Unlike the bags you are use to getting at the grocery store the Bagnesia bag is a washable nylon bag that folds up to about the size of a compact digital camera or a small wallet. It has an elastic strap sewn into the seem so you can keep it neat inside your purse or glove box. It’s small enough that I leave it in my purse of diaper bag so I always have at least one bag with me. The door hanger is a great reminder for your front door. And just in case you missed that reminder, the steering wheel wrap is right in front of your face! I’ve actually gotten in my car and remembered my bags because of the wrap. If you are like me you probably have a billion things to carry with you. The small carrying pouch and clip are nice because you can throw your cell phone, wallet and keys inside while you shop…and you don’t have to carry your big purse into the store with you. Or you can toss it into your diaper bag so you don’t have to go rummaging for it when you get to the register. The Reminder Kit sells for $14.99 and would be the perfect gift to the eco-junkie or eco-rookie! Want to add more? Why not add a set of 4 produce bags to your purchase! 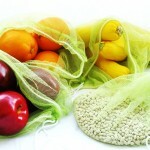 These washable mesh nylon bags will replace those smaller plastic bags you place your produce in. They are lightweight and compact with a drawstring closure. The produce bags sell for $7.99 for the set. Win It! 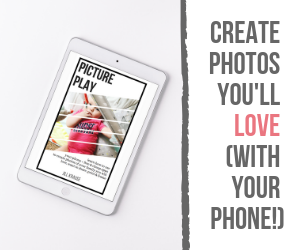 Be one of two lucky readers to win in this giveaway! The first winner will receive a Bagnesia Reminder Set and the second winner will receive a set of 4 produce bags. To enter, visit Bagnesia and tell me one of the Envirofacts from their site. Leave your answer below. Giveaway open to all residents in the US over the age of 18 yrs old. Must leave a comment for each entry with a maximum of 10 entries total. Giveaway ends December 7, 2009 at midnight (EST). Entrants must leave their email to be contacted if they are selected. Giveaway ended! ECO-ngratulations Cinella and Lauren! More from the Eco-Holiday Gift Guide. *This post is sponsored by Bagnesia. Marine Life. Over 100,000 marine animals are killed each year from plastic bags. Sea turtles, water birds, and other creatures mistake them for food or become entangled in them. In some parts of the ocean, there are six pounds of plastic for every pound of plankton. Loaded Landfills. Plastic bags don’t biodegrade, they photo-degrade, breaking down into smaller toxic pieces. Paper bags do not degrade any faster than plastic. In modern landfills nothing completely degrades due to lack of water, light, oxygen and other necessary degradation elements. One bag doesn’t take up much space, but millions do. The Wall Street Journal put the number of plastic bags used at 100 billion per year in the US alone. First entry: Fact I learned…. Paper bags consume more energy than plastic. It takes more than four times as much energy to manufacture a paper bag as it does to manufacture a plastic bag. I also entered the myEarth360 giveaway. Plastic bags are light, and can blow in the wind. They fly into trees and into wildlife habitat. Animals can consume these plastics, and perish. Plastic bags are a deadly killer to wildlife. That’s scary. Thank you! Plastic Bags are a suffocation hazzard! Litter. We may think we’ve thrown out a plastic bag but many of them may blow out of trash cans and become litter. Some are carelessly tossed aside causing urban tumbleweed. Entered the Growing Green Bums giveaway. Entered the Apple Orchard Giveaway. The production of plastic bags requires petroleum and often natural gas, both non-renewable resources that can cost big production bucks over time. In some parts of the ocean, there are six pounds of plastic for every pound of plankton. I entered the ‘I Cherish Planet Earth’ book from Challenge & Fun giveaway. I entered the Labryinth balance Board from Challenge & Fun giveaway. I entered the myearth360 giveaway. I entered the Piggy Paints giveaway. Subscribe as khrysdoll@yahoo dot com. Entered Eco-Holiday Gift #4 giveaway. Entered Eco-Holiday Gift #5 giveaway. Entered Eco-Holiday Gift #8 giveaway. Entered Eco-Holiday Gift #7 giveaway. Entered Eco-Holiday Gift #10 giveaway. Entered Eco-Holiday Gift #11 giveaway.